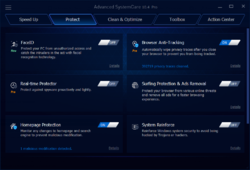 Advanced System Care Pro 10.4 was available as a giveaway on June 28, 2017! 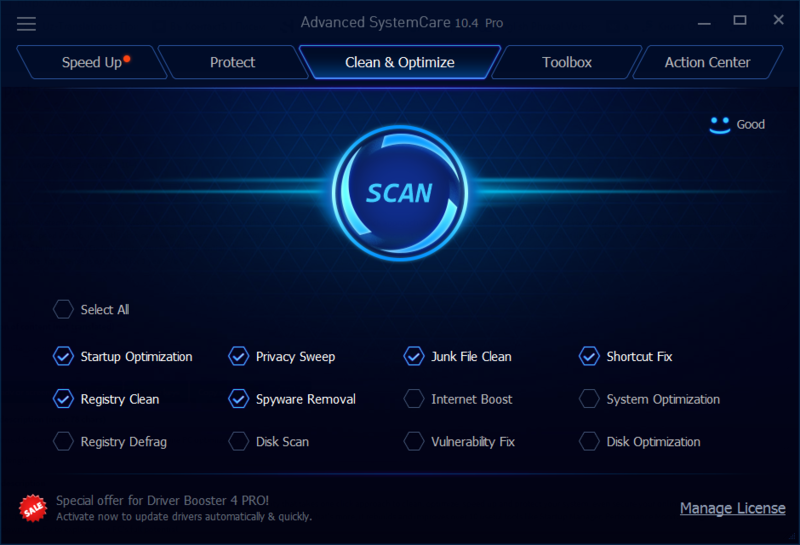 How would you improve Advanced System Care Pro 10.4? Add a discount after the one year license expires. "Advanced SystemCare download failed. Please set the proxy and try again." I have no idea why it is doing this as it installed without a problem on another computer. I keep getting a error when trying to install that says: "Advanced SystemCare download failed. Please set the proxy and try again." I have no idea why it is doing this as it installed without a problem on another computer. no download link, just sends me to a "woops" page. I like using these software utilities, they sometimes help your computer run better, smoother or quicker! But, you have to be careful when using the registry cleaner! If using it at all! It can damage or mess-up your computer's registry big time! Why would anyone dv this? Sage advice you ignore at your peril. I like this program, but its default setting should be to not run the registry cleaner. Bill batross, Why would anyone dv this? Sage advice you ignore at your peril. I like this program, but its default setting should be to not run the registry cleaner. I have tried to install but constantly get the free version - it will not install the pro version offered by GOTD can anyboidy help here? Installed and activated smoothly. Program is helpful. What can annoy some is that they advertise their other products quite often. But besides that, it functions well and does what it says it will. It speeds up my PC and has cleaned up a good amount of junk so far. The last time I installed this software, it contained a process that, upon a system reboot, would spawn a task that gobbled up all my remaining memory until my system became extremely unstable. It would then take me forever to launch task manager to kill the process that was eating up all my memory. After I uninstalled their software the problem went away. Never again. Hi inside, Dowmloaded and installed witout problems. I was automatically registered, I didn't need to copy the link in the readme file. 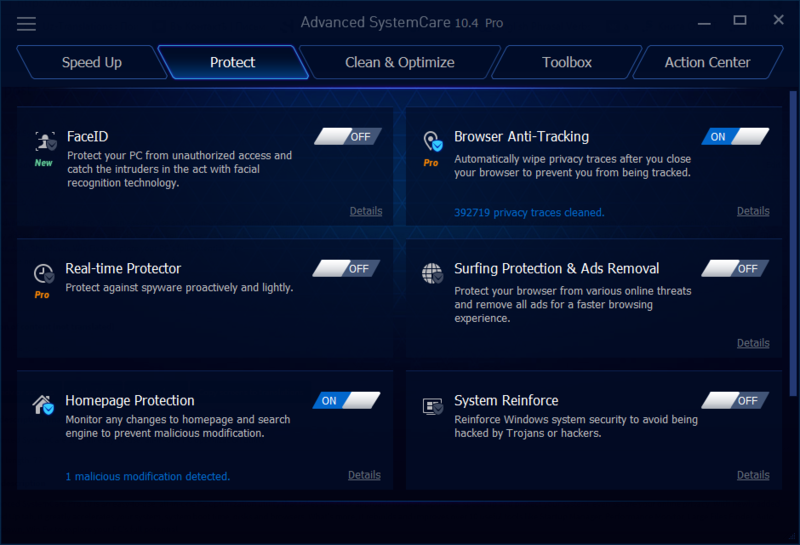 I am a longtime user of Advanced Win Care, I highly recommend it. Pro version is well worth the price of admission. Kerish Doctor.......need I say more. 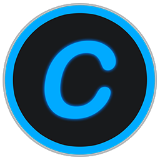 Timothy P. Ament, I installed Kerish on its last Give-Away but haven't used it yet; I want to image my OS drive first just to be safe. What are your experiences with Kerish? 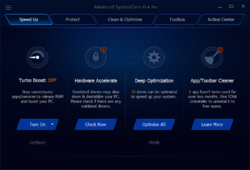 Does it really and truly optimize a PC and what kind of performance gains did you achieve? Thanks in advance. Yes, I truly believe that Dr.Kerish is the best optimizer available to us, common people. What's more, I've purchased it just for $9 for a two-year period on three computers. My third choice is Reg Organizer, especially the "Uninstall" module. and close it for today. Timothy P. Ament, Yes, I truly believe that Dr.Kerish is the best optimizer available to us, common people. What's more, I've purchased it just for $9 for a two-year period on three computers. My current number 2 choice is AVG PC Tuneup, but it's bigger, slower, etc... My third choice is Reg Organizer, especially the "Uninstall" module. My usual use of Kerish Doctor is 1. update, 2. Run Full Scan, 3. Clean up of Junk files, 4. Check all three "optimization" - Startup, service, recommendations - submodules, 5. Once a week check for Internet Booster (requires re-boot), and close it for today. Kerish Doctor is the BEST UTILITY. You won't be unhappy! Justin Alias, Kerish Doctor is the BEST UTILITY. You won't be unhappy! Johjn A., I would venture to say that 'WISE CARE 365' is every bit as good as Kerish Doctor. Timothy P. Ament, I don't understand why there are 4 down-votes on my comment. I tried using ASC in the past and it did anything but speed up my computer, as a matter of fact it slowed it to a crawl after every reboot. I was simply asking if Kerish was worth installing and I thank everyone who responded with valuable feedback. My Malwarebytes program alarmed and quarantined this program. When I checked their forums I was strongly advised to avoid Advanced System Care. What now? Laley, Find another program, read reviews and do your homework. ASC?? My advice is to keep well away from it, so you've had a lucky escape. I tried this IObit product and after running scan and optimizing, I had to restart. I have always had fast startup times, 15-20 tops. After first reboot after optimizing I was shocked to see my machine take forever to boot, AFTER it finally did a got a nice little box stating it took my computer 55 seconds to boot, and offer to share on face book LMAO! I did give it benefit of doubt and restarted again to see, and again 57 seconds. Also optimizing my internet connection and firefox completely ruined my fine tuned system, firefox went from 3-4 second to open homepage to I don't know how long 30-40 seconds? Needless to say I unistalled this product and did a system restore. Very disappointed, but that's what you get from bloatware, I should of known. I tried this IObit product and after running scan and optimizing, I had to restart. I have always had fast startup times, 15-20 tops. After first reboot after optimizing I was shocked to see my machine take forever to boot, AFTER it finally did a got a nice little box stating it took my computer 55 seconds to boot, and offer to share on face book LMAO! I did give it benefit of doubt and restarted again to see, and again 57 seconds. Also optimizing my internet connection and firefox completely ruined my fine tuned system, firefox went from 3-4 second to open homepage to I don't know how long 30-40 seconds? Needless to say I unistalled this product and did a system restore. Very disappointed, but that's what you get from bloatware, I should of known. Mike, It is The worst 'optimiser' on the market. It was good several years ago. I had to stop using ASC a few years ago now as it messed my whole system up. I don't go near it now. Lesson learned. An outstanding product that I use on my personal systems and have suggested to customers when working as DSL internet tech support for AT&T. I use to use ASC for years and though it worked well. I've run it on all OS from XP on up to 10. I uninstalled in the past year because I got sick of it constantly trying to install it's other programs. Plus it was taking up so much of my background space. I felt hounded and just didn't want to have to babysit it all the time anymore. Yes, be careful when you install it. Make sure you do advance install. If you don't pay attention you will be downloading several PUPs that you agree to downloading because you didn't read or pay attention! Since uninstalling my pcs actually run faster and I don't have to be hounded with updates/install this program or that. If Iobit would not make ASC so intrusive, I'd love to use it again. 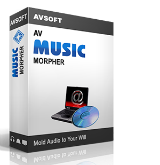 There are other wonderful programs out there that don't need to run constantly or have to constantly try to get you to update/install their programs. Google Iobit and Advanced System Care. There are so many out there that do not recommend it. But there are a few favorable reviews as well. Bottom line: use at your own risk. There are good valid reasons why Malwarebytes, Avira and others block you from having. LisaP, Totally agree with you Lisa. Nagware (orBotherware as I call it) can be very annoying and time wasting. Avast is the same but I guess all AntiV's are too, nowadays. LisaP, Totally agree with you Lisa. Nagware (orBotherware as I call it) can be very annoying and time wasting. Avast is the same but I guess all AntiV's are too, nowadays. Panda free antivirus isn't the same. Been running it for 2 years now and hasn't annoyed me once with ads or anything at all for that matter. I highly recommend it. Terry E, Panda free antivirus isn't the same. Been running it for 2 years now and hasn't annoyed me once with ads or anything at all for that matter. I highly recommend it. when installed iOBit Uninstaller Pro 6.2 (GOTD version), then i got Advanced SystemCare 10.2.0 free. 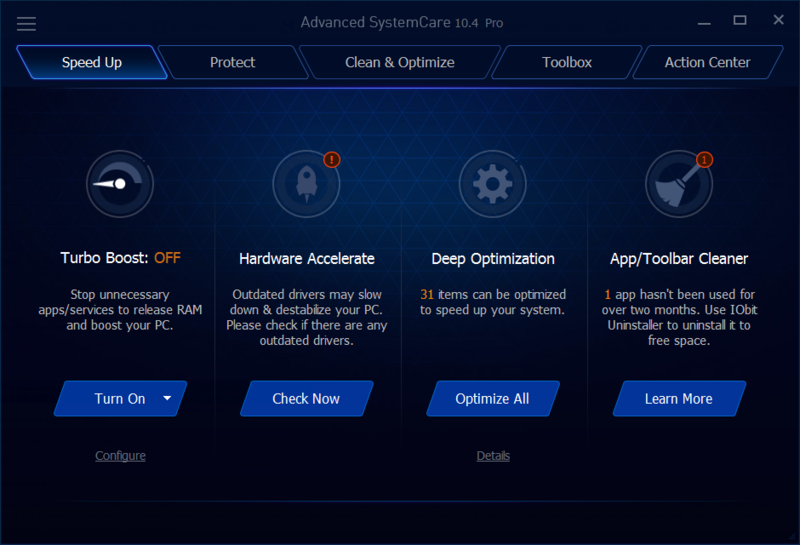 now, Advanced System Care Pro 10.4 (GOTD version) is out. how would i go about to get it? can anyone share your experience. donald chooi, you can upgrade to version 10.4 no problem, apply the reg code ,, look for the button at the bottom right of ASC, and throughout the year accept all updates, your reg will stay valid, ASC is very friendly that way. donald chooi, just download and follow the direction in the readme file after you extract all the files to the one folder. The key to this version will be in the readme file. Hi, JC & Paul Kelly thanks for taking the trouble to reply. NEVER use CCleaner for cleaning the reg. Just a tidy up is all you need it for which it does better than most. Charles Raisor, NEVER use CCleaner for cleaning the reg. Just a tidy up is all you need it for which it does better than most. seagrape, Do you know of 10 bit stealing MB's software some years back??? Have a look, Google it, and you'll see why they are in conflict. Nice cleaner and optimizer. I like that. Good optimizer/cleaner. It's thorough and dependable. Jeff Wilson, Oops, forgot to say THANKS to IObit and GAOTD! Jeff Wilson, it most certainly isn't! This is the worst 'optimiser' on the market. Having seen the decline since 2008 in this companies software.... This one being at the top of the list... I warn you to create a System Restore Point B4 you let this misrepresented garbage make any changes to your PC. You have been warned. Tells me the code is invalid. It uninstalled my previous version. How do I get this to accept the code? Can we install this, (or just enter the code in our installed version) , to extent our current licence? I mean, if your current license is less than a year old just replace it with this key, think it's just a standard year license key from today onwards. My heart be still, another one year license. I had this installed some time ago (no license restrictions), yet I removed it. I also once used IO bit's antivirus. I pulled that out too. IO bit has had a long history of software development standards that appear to be "less than ethical". Lets face it guys and gals, we simply never know what any program is doing under the hood. No, I am NOT suggesting IO bit is doing that or has ever done that. However, the presence of law suit(s) simply says to me, stand clear. Thanks for the offer GAOTD, but I'll pass. Frank Russo, There actually are programs which tell you whether your "data is being siphoned" running said program in a sandbox environment and monitoring it. My real question is whether such a program(s) exists that monitor the whole computer in real time for the purpose of looking for data siphoning ? Problem is that sand-boxing requires a deliberate effort. As for realtime, I do not know of ANY tool. Hi Charles, Thanks for the feedback ! My real question is whether such a program(s) exists that monitor the whole computer in real time for the purpose of looking for data siphoning ? Problem is that sand-boxing requires a deliberate effort. As for realtime, I do not know of ANY tool. Works fine for me on one Windows 7 laptop and two Windows 10 laptops, no problems installing and registering the software and optimising these computers. Installed on Win. 7 Home Pro perfectly. I really like this program. When the license expires ( if you don't buy it ) most options still work. Thank you, GOTD. Tried to register. Wants credit card number before going any farther. WHY??? Kept Win 7 backup and Win 10 backup since time when converting to 10 was free. Used Win 7 convenience rollups to keep backup bang up to date. offers can be installed on both systems and both backed up. Do ensure all Giveaways you like to keep are installed on Win 7 then back it up. use Windows10 Creators Upgrade or latest upgrade version to upgrade from Win 7.
available build of Win 10. Updates return .It don't get much better than that! Kept Win 7 backup and Win 10 backup since time when converting to 10 was free. Used Win 7 convenience rollups to keep backup bang up to date. About 10 mins to switch operating system from 10 to 7 or vice versa so Giveaway offers can be installed on both systems and both backed up. Do ensure all Giveaways you like to keep are installed on Win 7 then back it up. Nice trick to get the latest build of Win 10 is to load that Win 7 backup then use Windows10 Creators Upgrade or latest upgrade version to upgrade from Win 7. Works a treat including all Win 7 software and Giveaways now working in the latest available build of Win 10. Having the latest Win 10 version means it'll be awhile before those annoying Windows Updates return .It don't get much better than that! Been using this for many years. I don't use all features as some are not safe if you don't know what you're doing. I like the program. Have used it on 7, Vista and 10. Just wish it were for more then a year subscription but they are in business to make money. why you not free this software forever? Shame ... as I view both programs as good, very useful software. Stephen Searle, I agree with your comments. I experienced the same problem and I sadly had to uninstall Advanced system Care for the same reason. user, Thanks. That is the same experience I had when I downloaded and installed this the last time. I even had intrusive popups from the installed unwanted programs and interfered with my virus scan program as well. user, You need to be careful when hitting agree buttons, to notice to what you are agreeing. Often, there is another checkbox to also install another Iobit program. and unless you un-check it, you are agreeing to install that one, too. 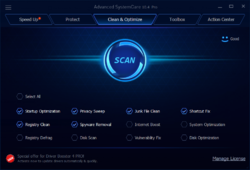 rich, which is probably why malwarebytes now detects ASC10 as a potentially unwanted program installer as it will install unwanted programs if you are not very careful and understand every choice you are offered and don't question every default setting. will not do aything. Clicking on the setup.exe makes absolutely nothing happen! Tried to run as Administrator and Take Ownership Of but nothing will make it run. Loopy, Works fine on windows 10, just downloaded and installed no problems. Oh good to know. Thanks Kevin will try it out. Kevin, Oh good to know. Thanks Kevin will try it out. Mike, I've had the same problem with numerous programs. I'm using Avast as an anti virus and I found that if I disabled the shields long enough to install the program, it worked without a problem. Not true for all programs, but you might try disabling your anti virus and see if it works.